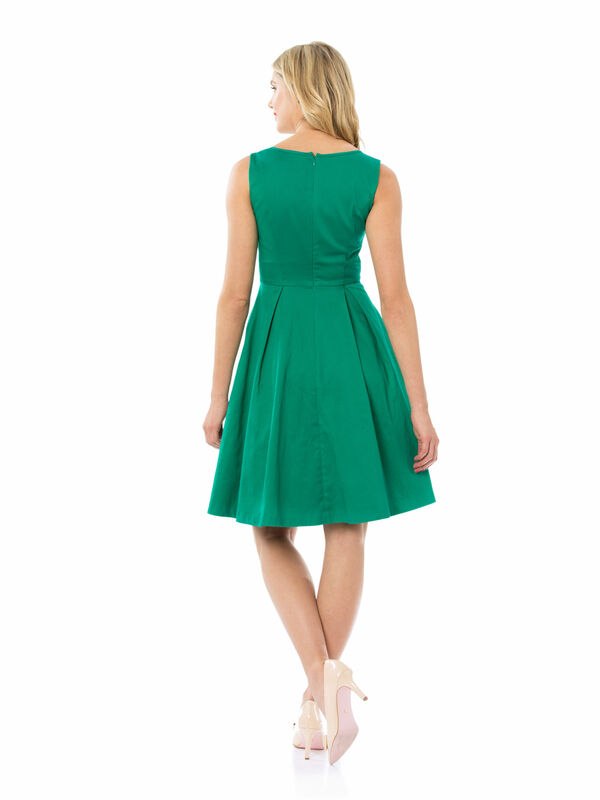 Broderie Dress https://www.review-australia.com/au/broderie-dress/RE19DR130.REGRN065.html Bring timeless beauty and classic style to your next event in the Broderie Dress. Sure to feature prominently in your evening and events wardrobe, this style makes a statement with its feminine silhouette and fine detailing. It's fitted at the bodice and features a full voluminous skirt boosted with hidden tulle underlay. With a hailspot tecture through the stretch cotton fabric, the dress feels as fabulous as it looks. The neckline is embellished with bold broderie lace. Broderie Dress is rated 4.8 out of 5 by 98. Rated 5 out of 5 by Latty76 from Exquisite I LOVE. LOVE. LOVE this dress. LOVE her so much I have purchased her in both the yellow and green. Dress up or down. Love the fit and flare it is the most flattering shape especially on my pear shape. Looks great with and without a belt and with or without a cardi. The lace detail neckline is beautiful and gives a hint of skin without showing too much. Could easily be made into race wear with a stunning fascinator. Rated 5 out of 5 by JennyEclair from Perfect Christmas dress I saw this dress online and just had to go and try it on. I try to buy a new dress for Christmas day every year, and this was perfect! As with all my other Review dresses, it fit impeccably, and the tulle between the main dress and the lining gave it that little bit of extra something. Also - pockets! I will be wearing this at least once a month, with or without the thin white belt I added on Christmas day. Rated 5 out of 5 by Gabbie77 from One of my favourite dresses I bought this about a month ago, and it has quickly become one of my favourite dresses. It is a stronger yellow than I initially thought (probably my monitor settings), but I actually love the sunshine yellow colour. The broderie detailing around the neckline is beautiful, and the dress falls really nicely. Overall, I am so happy with this beautiful dress! Rated 4 out of 5 by Leashie from Festive green dress Great length of the skirt section of the dress. Excellent lightweight cotton material the lining is polyester which is fine in this weather, but when the weather heats up cotton lining would be preferable. The tulle is a nice touch, as for the neckline embroidery it is a little revealing but not offensively. A way around this would be to wear a bralette. Rated 4 out of 5 by JessieMRog from Pockets! This dress is truely stunning. A brilliantly bright colour to celebrate the warmer weather in, complete with elegant detailing around the bust. Words can hardly describe how delighted I was when I also discovered that it has pockets! How practical! The only draw back that I can see with this lovely dress is that the material does crease rather easily. Rated 5 out of 5 by nsmart22 from Canary yellow princess I had already purchased the green version of this dress but when i saw this yellow release i just couldnt say no. Im not usually a yellow fan but i was happily surprised. It looks good on my paler freckled skin and red hair. I love the front bust detailing and it has best flair from the waist. Looks cute with a black, red or gold belt.